Successfully Added Digital Camcorder, 12M Pixel CCD, 2.5-inch Display, 32MB Int.Mem to your Shopping Cart. Good Digital Camcorder product with max. 12 Mega Pixel still image(Interpolated) and others are 7.0 Mega Pixel, 5.0 Mega Pixel, 3.0 Mega Pixel, 2.0 Mega Pixel. It is compatible with max.2GB SD card and built-in 32MB flash. 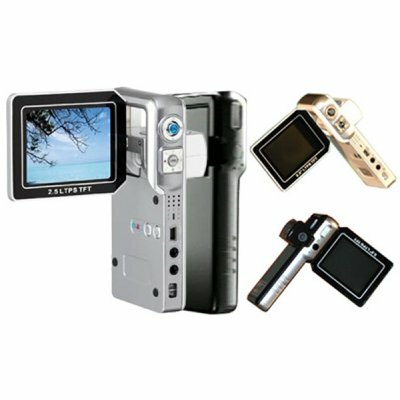 Features high quality 5.0 Mega pixel CCD image sensor and includes 270 degree rotating 2.5 inch Color TFT LCD screen. It needed a rechargeable Li-ion battery to give power supply and connected with computer by USB2.0. It is able to be a PC camera and resolation is 320x240 pixels..